Targeted cancer treatments are starting to make a big difference to the lives of cancer patients, but their effectiveness diminishes over time and for some patients, these treatments may not work at all. Now large-scale screening techniques are helping scientists to uncover the mechanisms that help cancer resist treatment. Here at The Institute of Cancer Research in London, we are pioneers in discovering and developing molecularly targeted treatments. These treatments work by attacking the mechanisms vital for the growth or survival of cancer cells and the development and progression of tumours. Targeted treatments can be extremely effective, but cancer is a complex web of circuitry – flipping one switch might work for a while, but the disease has an uncanny knack of being able to rewire itself and acquire drug resistance. But a process called RNA interference (RNAi) screening offers scientists a way of testing how this resistance develops. RNAi allows scientists to investigate the role of individual genes on cell behaviour. Dr Steven Whittaker is leader of the Molecular Drug Resistance Team at the ICR and he uses RNAi screening to investigate these mechanisms of resistance in melanoma and colorectal cancer. The screening method he uses works by taking viruses and modifying them with a small piece of genetic material called short hairpin RNA (shRNA). 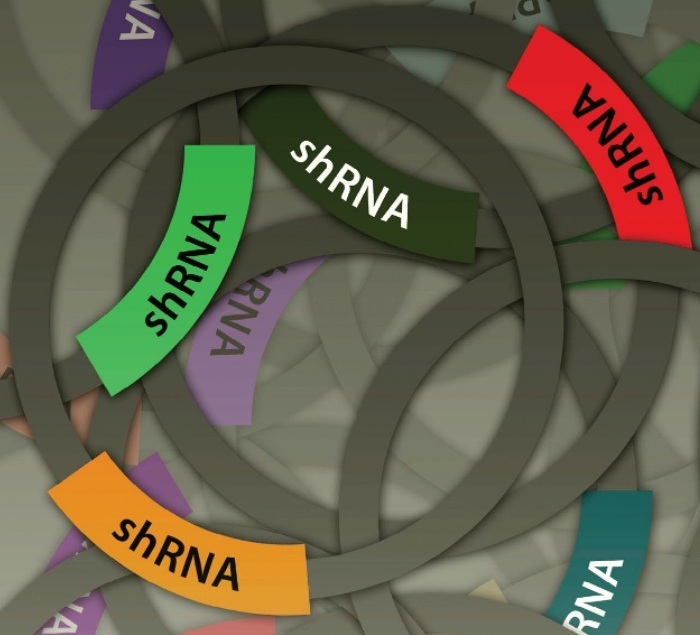 The shRNA induces the virus to switch off a particular gene inside a cell’s DNA by destroying the messenger RNA molecules which translate a gene’s message into a protein. Infecting cancer cells with the virus switches off the target gene, and by switching genes off one at a time, researchers can start to tease out the mechanisms underlying resistance to treatment. So far so good, but there might be thousands of genes that could potentially influence resistance to treatment – to investigate these mechanisms in a systematic and unbiased way, and to speed up the screening process, more sophisticated methods are needed. Now large-scale or even genome-wide RNAi screens are becoming routine, thanks to libraries of shRNAs which pool together many thousands of shRNA-modified viruses at once, allowing scientists to silence almost any gene at will. In a study published in the journal Cancer Discovery, Dr Whittaker and a team from the Dana Farber Cancer Institute and the Broad Institute in the US used a library of 90,000 shRNAs targeting 16,000 genes in melanoma cells. They infected the cells with the viral library, then treated them with a targeted melanoma drug called a RAF inhibitor until treatment-resistant cells started to emerge. Using next-generation sequencing, high-tech machines which can scan thousands of samples simultaneously, they measured the relative abundance of each shRNA found in the resistant cells compared to control samples, to see which genes were silenced in the resistant melanoma strain. They found that the gene NF1, which encodes the tumour-suppressing geneneurofibromin, was the gene most frequently lost in treatment-resistant cells. The loss of NF1 resulted in resistance to RAF inhibitors by reactivating a pathway called MAPK, which is consistent with findings from other melanoma studies where RAF inhibition has stopped being an effective treatment. To confirm losing NF1 was the reason why melanoma cells developed resistance, they infected another strain of melanoma with a virus to silenceNF1 directly. When they added the RAF inhibitor, they found that NF1suppression did indeed allow the melanoma cells to evade treatment. And importantly, NF1 mutations were found in melanoma patients who developed resistance to the RAF inhibitor. Dr Whittaker’s study shows that large-scale RNAi screening is an effective way to investigate resistance mechanisms in cancer. The technique can identify the genes which allow cancer cells to develop resistance, and once the genes at work have been identified, researchers can start to develop methods to prevent resistance to treatment happening in the first place.